A heart attack happens when blood can’t get to your heart, and your heart muscle doesn’t get the oxygen it needs. Without oxygen, its cells can be damaged or die. The key to recovery is to get your blood flow restored quickly. 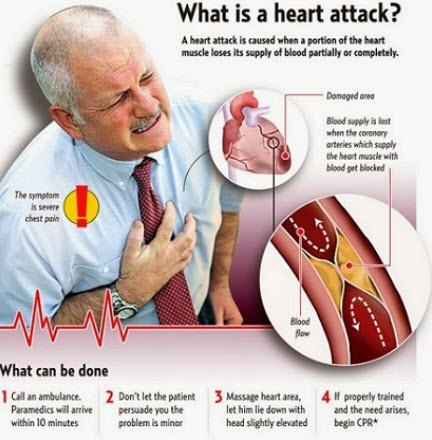 Rapid medical help is critical so as to treat symptoms of a heart attack. If you or someone you’re with has symptoms that might be a heart attack, call 911 right away. If it is, you’re more likely to survive if you get treated within 90 minutes. While you’re on the phone, the person should chew and swallow an aspirin (unless they’re allergic) to lower the risk of a blood clot. Are they unconscious? Hands-only CPR can double their chances of survival. An EKG, which checks your heart’s electrical activity, can help doctors see if you’re having a heart attack. It can also show which artery is clogged or blocked. Doctors can also diagnose a heart attack with blood tests that look for proteins that heart cells release. You’ll likely have a procedure called a coronary angiogram. A thin tube with a tiny balloon on the end goes through your artery. It opens up the blockage by flattening the plaque against the walls. Most times, doctors place a small, mesh tube called a stent in your artery to make sure it stays open. For some people, taking a daily aspirin will help. Talk to your doctor to see if it’s right for you.